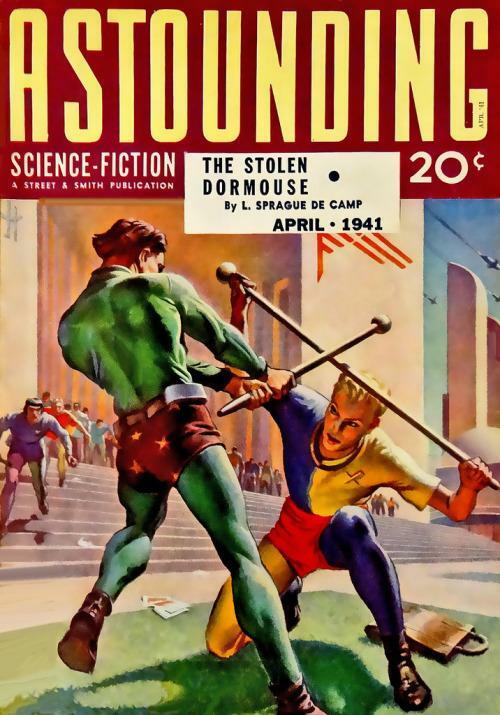 This one appeared on the cover for Astounding, April 1941, and illustrated “The Stolen Dormouse” by L. Sprague de Camp. 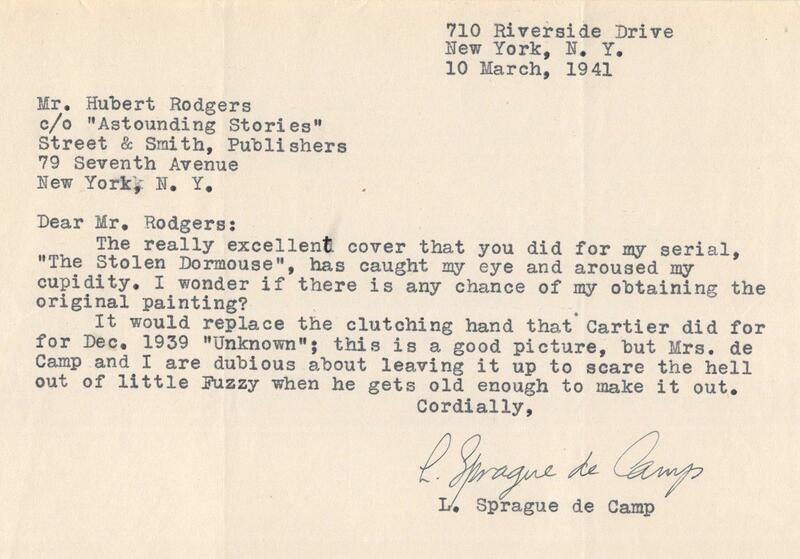 Shortly after its publication, De Camp wrote to Rogers, asking if he could acquire the painting, which he did. 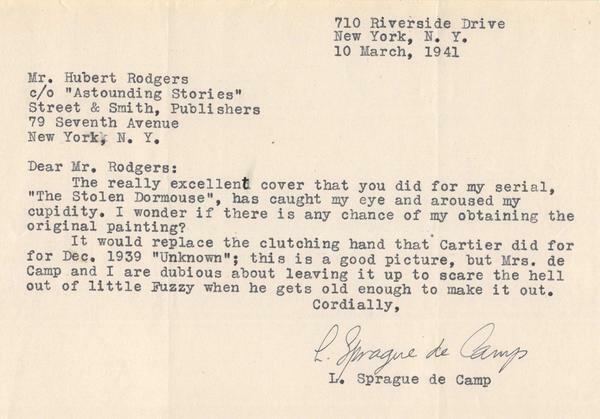 I’m attaching a copy of De Camp’s letter of inquiry (dated March 10, 1941), which notes that it would replace on his wall Edd Cartier’s painting for Lest Darkness Fall by De Camp. 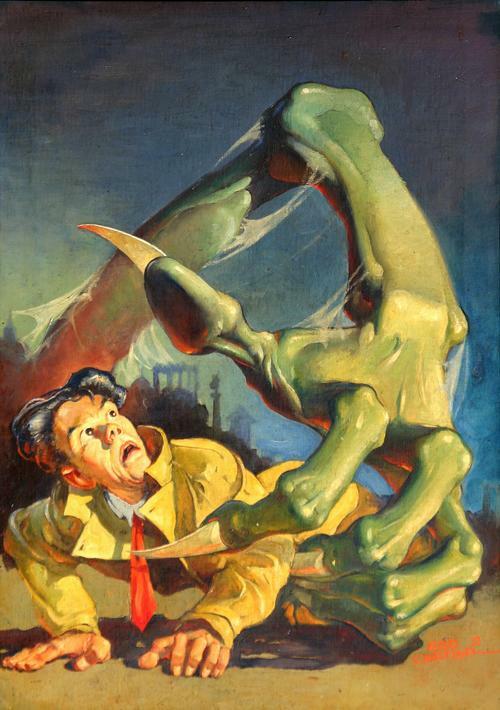 Cartier’s painting had appeared on the December 1939 issue of Astounding’s sister publication, Unknown (De Camp mistakenly identifies it as the November issue). The two paintings are now once again re-united, as that Cartier painting is currently hanging in our living room. 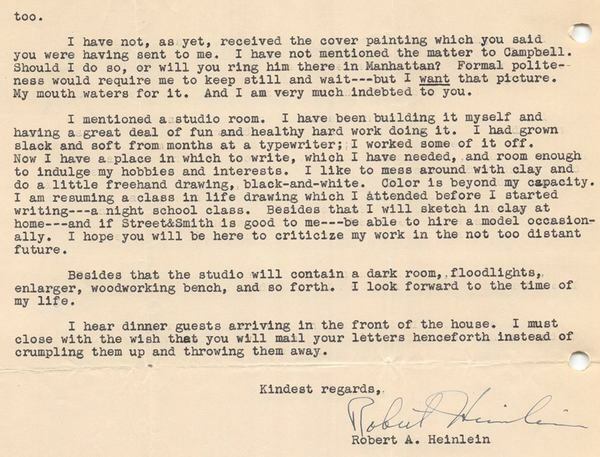 De Camp wasn’t the only SF author who wrote to Rogers regarding the painting for “The Stolen Dormouse.” Robert Heinlein was a huge fan of Rogers’ art, and here’s a copy of a letter from Robert Heinlein to Rogers, dated March 28, 1941. 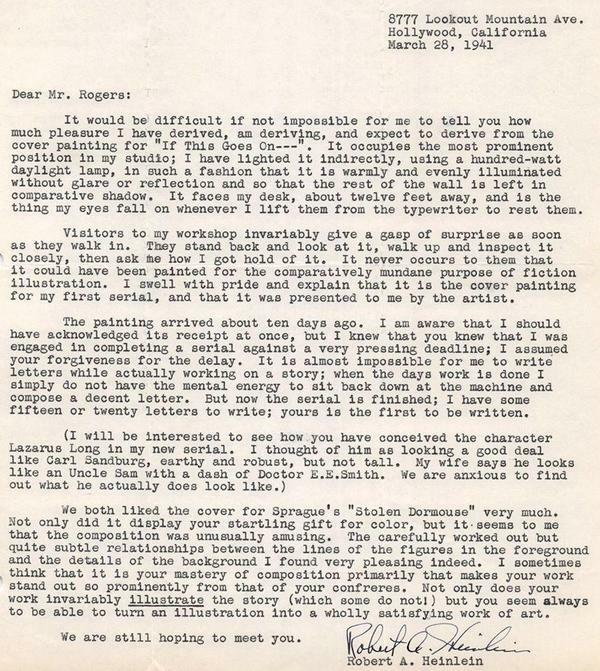 Towards the end of the letter, Heinlein weighs in on the cover to “The Stolen Dormouse,” praising it highly. 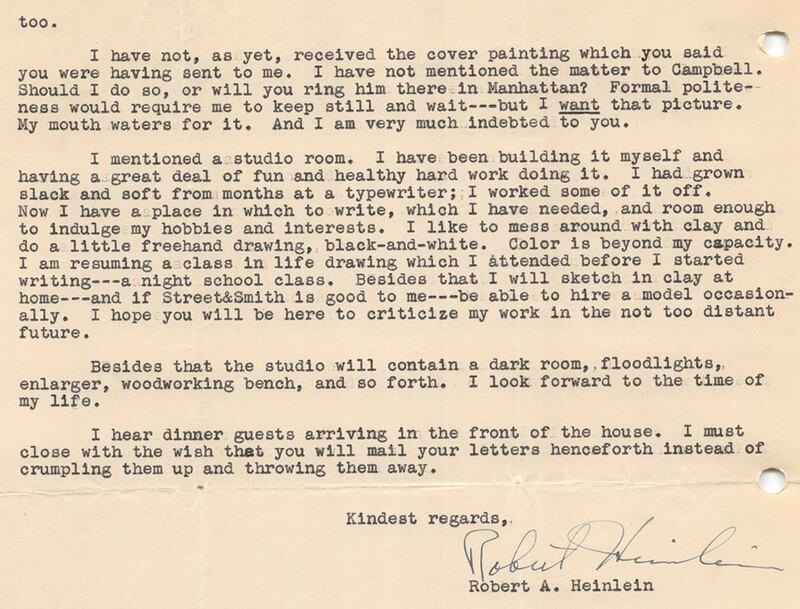 Most of Heinlein’s letter, however, deals with Heinlein discussing Rogers’ cover painting for “If This Goes On—” by Heinlein, which had appeared on the February 1940 issue of Astounding and which Rogers had sent to Heinlein. 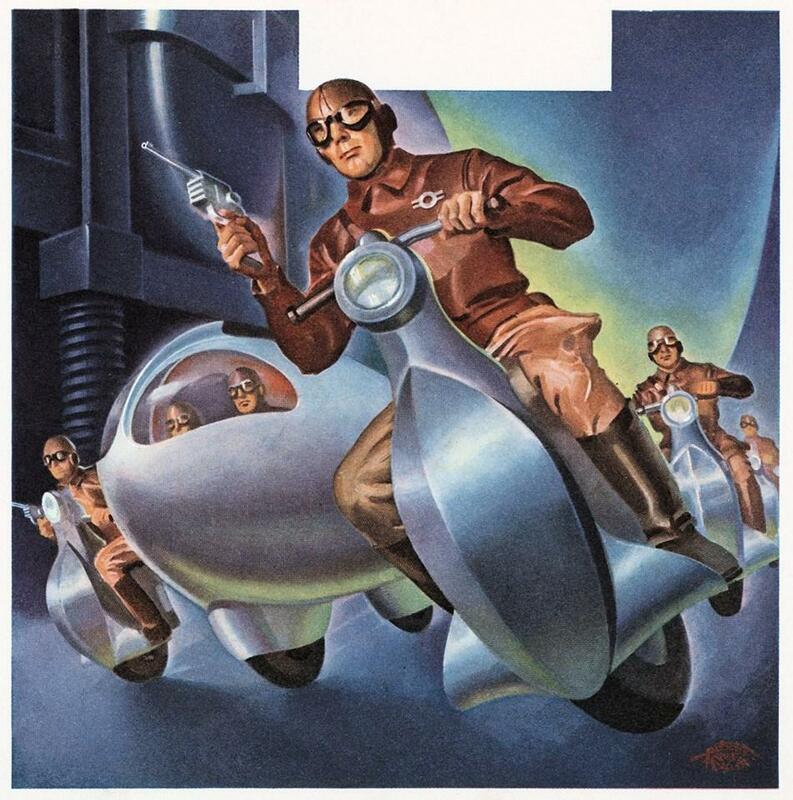 I don’t have an image of the original cover art for that painting, but here’s a scan of a proof of the cover. 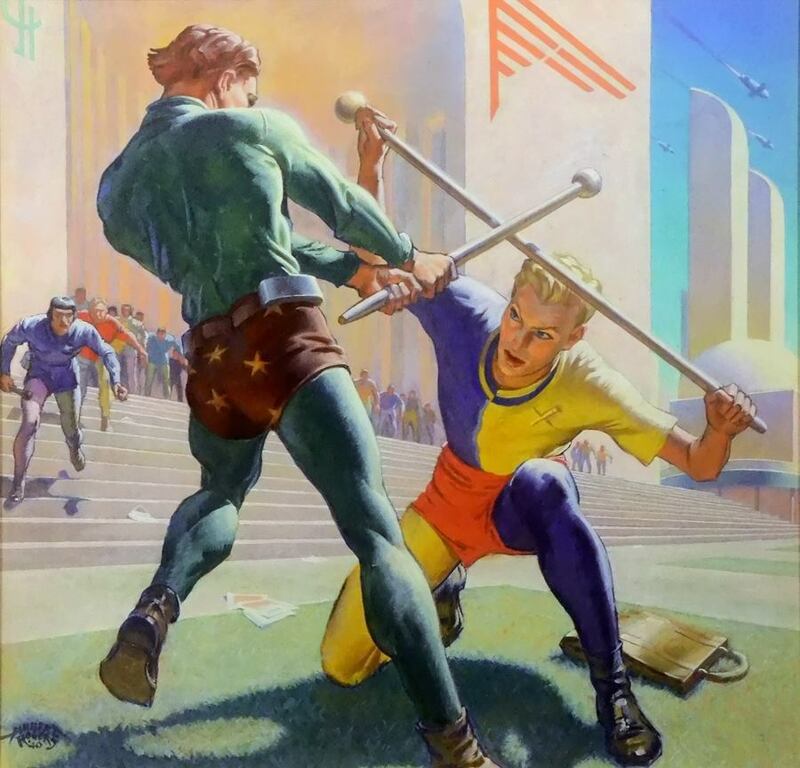 The proof is the same as it appeared on the published magazine, except that the magazine had a red stripe at the bottom which set forth the name of the story. 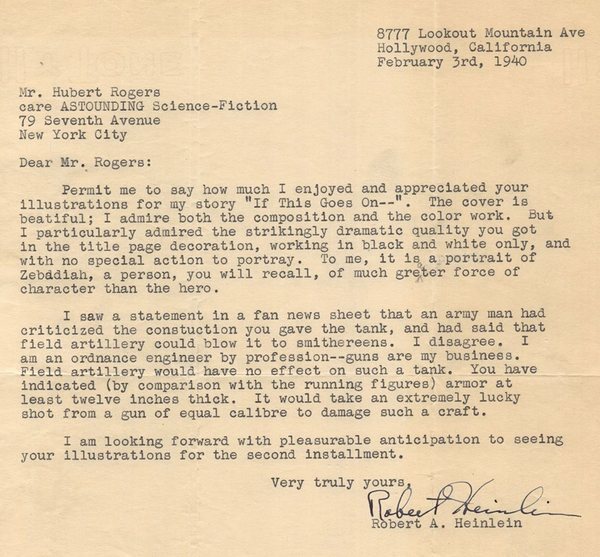 In addition to this March 28, 1941 letter, I have three other letters from Heinlein to Rogers, with art as the main topic, particularly “If This Goes On–.” However, since the second letter, dated August 11, 1940, concerns Rogers’ cover for Heinlein’s “The Roads Must Roll” (Astounding, June 1940), I’ll run a proof of that cover here as well. The first letter, dated February 3, 1940, is the first letter I’m aware of from Heinlein to Rogers, and discusses both the cover and interior illos for “If This Goes On—“. 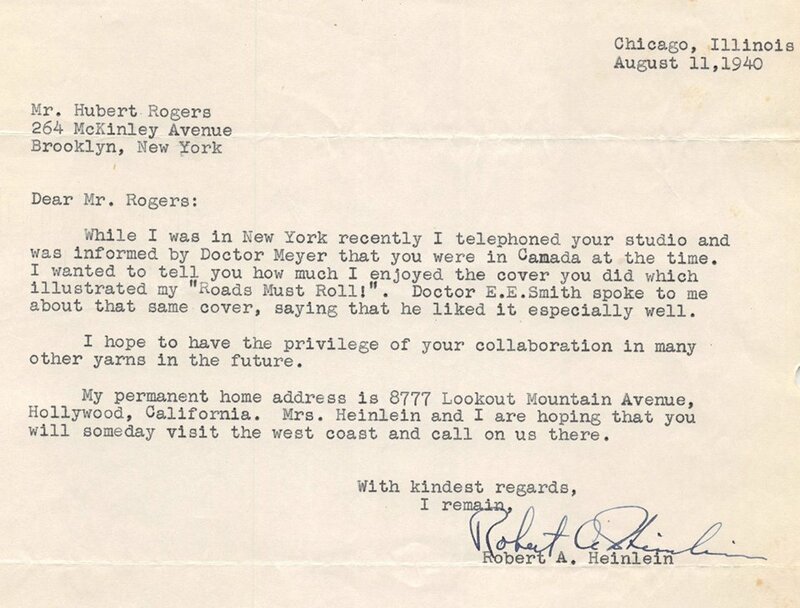 The second letter, dated August 11, 1940, touches on an attempt by Heinlein to visit Rogers at his studio, foiled when it turned out that Rogers was away in Canada at the time. 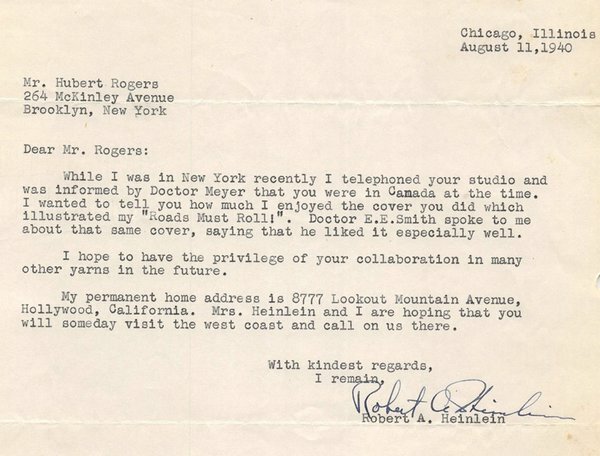 The third letter, dated February 9, 1941, is the longest – running two pages – discusses many of Rogers’ other covers, including for stories by other authors. 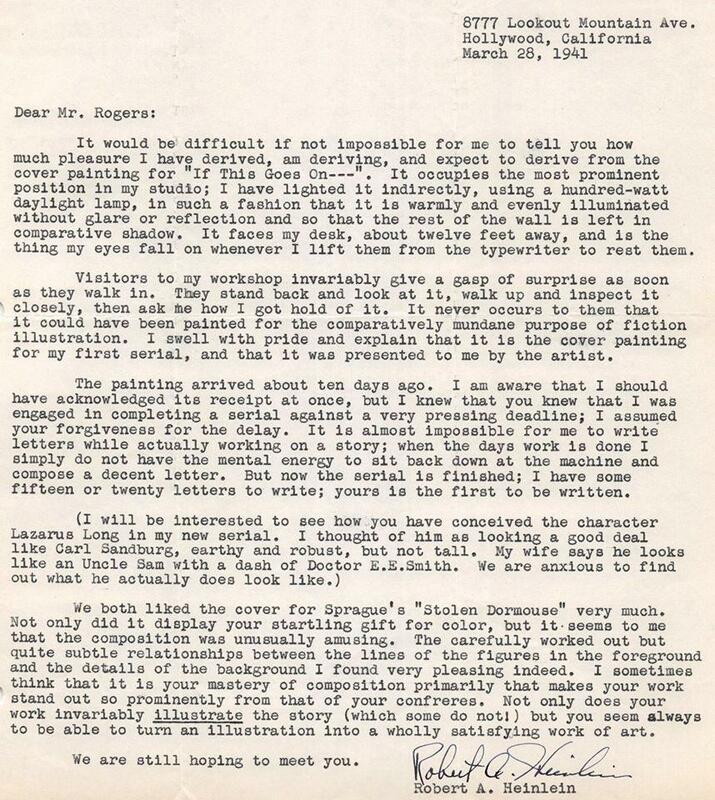 And apparently Rogers’ prior letter to him revealed that the original painting for “If This Goes On—“ was being sent to Heinlein, as Heinlein notes that it hasn’t arrived yet. 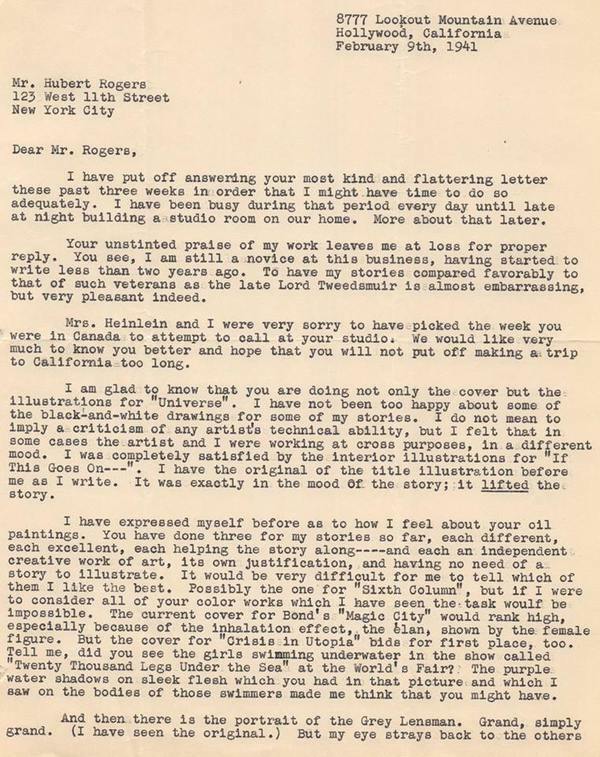 The March 28, 1941 letter, above, picks up the story from when it does arrive. Heinlein’s appreciation of Rogers’ work would continue in the future. In 1947, when Scribner’s was going to publish Heinlein’s first book, the juvenile Rocket Ship Galileo, the editor asked for his suggestion as to who could illustrate it. 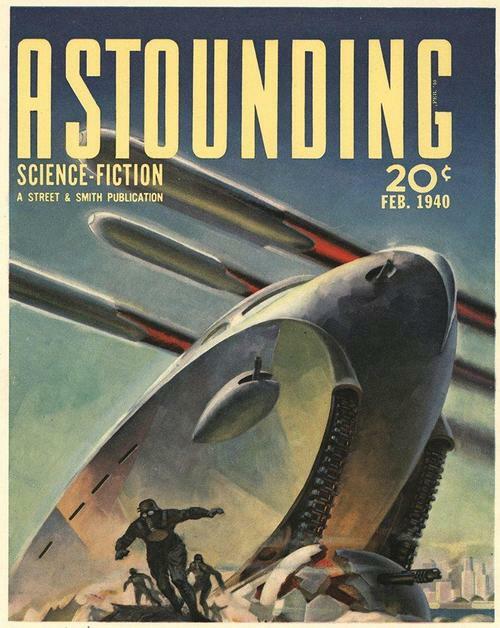 Heinlein recommended Rogers for the job, but this was shot down, because the editor felt that Rogers was too closely associated with “a rather cheap magazine” – Astounding. As evidence of this, she sent Heinlein pulp paper tear sheets from Astounding with Rogers’ art for “By His Bootstraps” by Anton MacDonald (Astounding, October 1941). Apparently, she didn’t realize that MacDonald was a Heinlein pseudonym! It’s a shame Rogers didn’t get the gig, but he would go on to do the dust jackets to several other Heinlein books for the publisher Shasta. I’m currently working with Hubert Rogers’ daughter on an art book of her father’s work. Very nice. I enjoyed “The Stolen Dormouse,” one of De Camp’s lesser known works. It took only a couple of seconds for that image to bring the specific scene illustrated to mind.